Gary Bautista, left, shown here with Bert Sagum and Hoku Low during a Society of Seven performance, died yesterday, two days after suffering a stroke and heart attack. Gary Bautista, veteran front man and master impressionist with the Society of Seven, died yesterday, two days after suffering a stroke and heart attack while performing in Los Angeles. Bautista, a member of the SOS since 1984, was 54. He fell ill Saturday night while performing at a private party at the West Ridge Golf Course. SOS leader Tony Ruivivar said in a statement that Bautista collapsed at the end of the show during a song "and was still singing on the ground -- we had to take the microphone away from him." Bautista had just concluded a skit with Bert Sagum, Ruivivar said, and had gotten a standing ovation. "He went down surrounded by the people who love him and doing what he loved: performing." Bautista's wife, Reeza; ex-wife, Julia Bautista; daughter Jewel; stepson Santino; and other members of the Society of Seven were at the hospital when he died, said Frances Kirk, of Outrigger Entertainment, former manager of the SOS and a longtime friend and supporter of the group. Kirk described Bautista as "a workhorse." "You know all those impressions that he did? He was meticulous," she said. "He worked on those impressions in the car in between shopping or going wherever. Gary was always practicing. That's the kind of guy he was." Bautista was known as "The Man of 1,000 Voices" during the early years of his career in the Philippines, but retired from all but the occasional casual performance after he moved to the United States. He was working as a loan officer in a bank in Southern California when the departure of SOS impressionist Jun Polistico left an opening in the ranks of Waikiki's popular show group. Ruivivar invited him to audition. Bautista won over audiences with a repertoire that included Luciano Pavarotti, Julie Andrews, Paul Anka, Alvin the Chipmunk, Willie Nelson and Elvis Presley. He was also featured in elaborate productions of Broadway musicals, and became a female impersonator in "boys will be girls" segments that were a staple of SOS shows at the Outrigger. Bautista could also dazzle an audience as a straight vocalist with an expansive repertoire, from pop to opera. 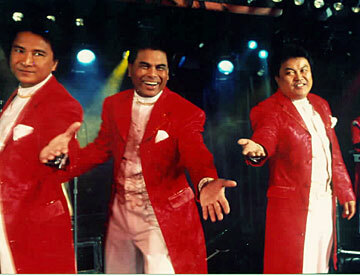 Bautista moved to the mainland when Ruivivar decided to base the group in Las Vegas. Bautista last performed here in February, when the SOS headlined the Hawaii Theatre with singer Lani Misalucha. Misalucha was onstage with Bautista in Los Angeles when he collapsed. Bautista is also survived by a daughter, Erica, and a son, Garyl, in the Philippines. Funeral plans are pending. Members of the Society of Seven are planning a golf tournament in Honolulu to raise money for Bautista's 9-year-old, Jewel. Entry forms can be requested by faxing 922-6955. In lieu of flowers, contributions may be sent to Friends of Jewel Bautista, care of Outrigger Entertainment, 150 Kaiulani Ave., Honolulu 96815.